Thursday July 11th 1878. We devoted all the forenoon to the work. Rob and Lee went after cherries and got nearly a bushel of splendid ones. I went to town the first thing after the dinner work was done. The [Healines?] girls and Win were here in the afternoon we ate supper in the yard. Mrs [illegible] and Nellie were here a few moments. About eight oclock when the girls went home Rob Hall and I went over to call on Mr & Mrs [Porsone?] at [Crippen?]. It was a pleasant moonlight night. Mother got the cherries all put up. 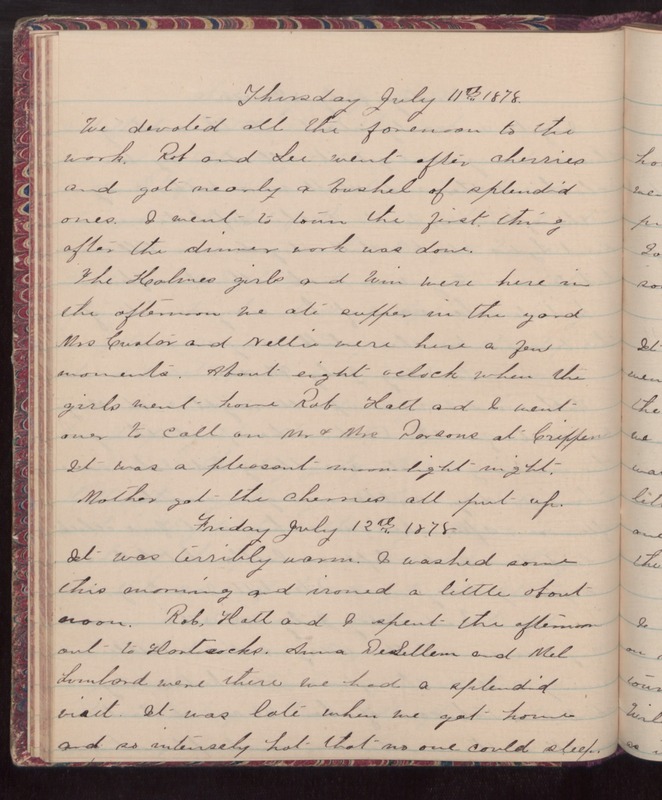 Friday July 12th 1878 It was terribly warm. I washed some this morning and ironed a little about noon. Rob, Hall and I spent the afternoon out to [Hontsacks?]. Anna [DeSillem?] and Mel [Lumlord?] were there we had a splendid visit. It was late when we got home and so intensely hot that no one could sleep.